Using press releases to increase awareness and improve SEO Using press releases to gain awareness and backlinks to your site was once a hot topic in SEO, but like everything that is hot in SEO, it is quickly forgotten about. ….. Chart of the day: A comparison of the effectiveness of paid search marketing contrasting Google’s search network with the display network This chart gives an update to historical data on conversion rates in Google Ads from the Google Ads management platform …..
A review of the costs and benefits of more investment in CRO / analytics According to the Customer Journeys research we conducted with the eCommerceExpo conference, surprisingly few business are actively involved in CRO – 33% of companies have limited or ….. Updated Webcertain 2015 Global Search and Social Report Value: The international search and social findings report from Webcertain spans 32 countries and measures social media engagement in terms of account ownership, visitation and usage. 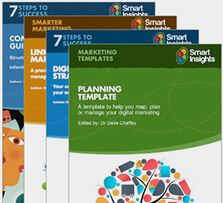 It has a snapshot of each …..
8 steps showing how to combine SMART and RACE to set campaign goals SMART goals are a commonly referenced concept in marketing, to help check that goals are Specific, Measurable, Actionable, Realistic and Time bound (i.e. have a deadline). Goals have ….. Working with your HiPPO Data / analytics can be both liberating and restrictive but the one thing it will always do and do well is ensure we remain commercially focused. I was at a clients HQ for the first time 2 weeks ….. It looks cool, but how should you use insights from attribution to improve media spend? With the growing maturity in analytics tools and the geniuses at Google and other analytics services working to improve them, it is great to see …..
5 Steps to empower your team to set relevant digital marketing goals Budget planning. It comes around every year like clockwork. Most CMOs or Marketing directors are pivotal to business planning in the first place, but even after the business plan …..
5 tips to avoid drowning in social media I am fortunate to be working in an agency environment, so I hear stories from various industries and brands related to digital marketing. It keeps me on my toes as it forces constant learning and …..